Enjoy chili dogs, footlongs, veggie dogs, and other delicious hot dog varieties at the best hot dog restaurants in Staten Island. Explore a variety of great venues where you can order the best hot dogs on Staten Island. One of the Best Staten Island Hot Dog Places! Are you tired of all these pretentious restaurants that offer you "healthy" alternatives to otherwise mouth-watering foods? 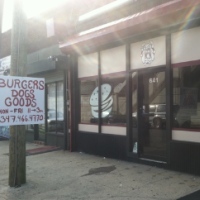 Then stop into Burgers N Dogs for some of the best comfort food in Staten Island! As you can probably guess from the title, one of the restaurant's signatures is its exquisite hot dogs. All quarter-pound dogs are deep fried, giving them a more distinctive flavor than your average hot dogs. Pair off your delicious dog with a side of the restaurant's hand-cut fries, all of which are seasoned to the point where you'll never need ketchup! Other to-die-for items include the mac 'n cheese--a spicy concoction made with four different cheeses and littered with bacon. Or you can order one of the half-pound burgers, fish tacos, empanadas, or a bowl of Mexican chili.